An avid blogger and biker, Sean Decatur ’90 is a new kind of president for Kenyon College in many ways. While his predecessor, Georgia Nugent, a classicist, broke the gender barrier at the once all-male liberal arts gem of the Buckeye State in 2003, Decatur has registered a couple more firsts at the cornfield-swaddled college. While Kenyon presidents of the past have tended to be white men with expertise in the humanities, Decatur is a black biochemist. His interest in furthering the sciences in liberal arts education and increasing the diversity of the student body, as well as diversifying Kenyon’s curricular offerings, will be key pursuits in his role, which began July 1. Previously, the Cleveland native was Oberlin College’s dean of the College of Arts and Colleges and professor of chemistry and biochemistry. Before joining Oberlin in 2008, he taught chemistry and was associate dean of the faculty at Mount Holyoke College. Talking by phone shortly after his arrival in central Ohio, Decatur reflects on the ways in which Kenyon resonates with his alma mater. Visitors to both campuses note physical similarities, although the barely-there town of Gambier, perched on its “Magic Mountain,” as Kenyon alums call it, makes the Swarthmore borough look like a metropolis. But there is the same dreamy vibe, Tudor buildings, and lush, old-growth trees. “In terms of the campuses, they’re both overwhelmingly beautiful,” says Decatur. 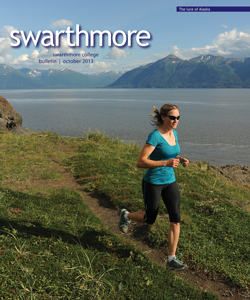 “And there is a similar atmosphere on campus of academics being a focal point, which resonates very well with my Swarthmore experience. The value of the intellectual life is similar between the two institutions as well as that sense of a closely connected community.” Both schools enroll about 1,500 students and are listed in the 2009 book The Hidden Ivies: 50 Top Colleges—From Amherst to Williams—That Rival the Ivy League. Key in helping him plot that path was the Mellon Mays Undergraduate Fellowship Program. Decatur and Garikai “Kai” Campbell ’90 were the first graduates of the initial Swarthmore cohort of six students. Chuck James, Sarah Lawrence Lightfoot Professor Emeritus of English Literature, coordinated the program from its inception in 1989 until 2007. Wearing a neat pink shirt, trim khaki pants, and fisherman sandals, James recently took time away from the office he still keeps in Parrish Hall to discuss his former mentee and the program that supported students of color who showed promise as future academic leaders. The Mellon program, of which Swarthmore was one of eight charter members that included Harvard, Yale, and Princeton, “was a unique idea to change the face of the academy to better reflect American society,” James explains. Through faculty recommendations, top students of color who seemed destined for the professoriate—rather than medicine or law—were chosen as fellows. James believes Decatur is the first fellow to ascend to a college presidency. “He’s a real dynamo and enhances the dynamics of the program,” he says. 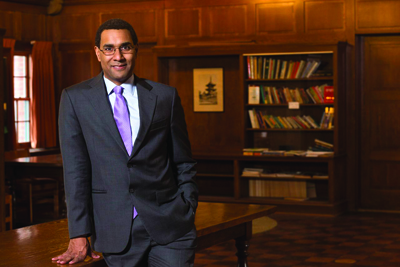 In turn, Decatur feels the recent appointment of Campbell, his fellow first Mellon graduate, to provost of Morehouse College (see Page 61 for details), offers further evidence of the program’s success.